Is it a coffee table? Is it an academic tome? Upon picking up Chris Leslie’s beautiful book Disappearing Glasgow I wasn’t sure. On the one hand it’s a lavish and sensuous photo essay. On the other, it’s a collection of short essays: a ‘spine’ provided by Leslie’s own exegesis of his work, and individual vertebrae provided by a diverse cast of writers. Is it news? ‘Everything you see in these photographs has now disappeared’ Leslie announces in his introduction. 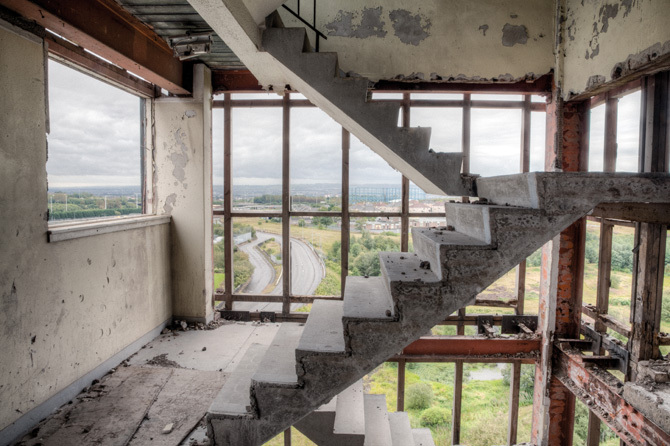 This is no longer Disappearing Glasgow, it’s a Glasgow that’s now long gone: a journey through six housing schemes that have now been demolished: Red Road, Gallowgate, Oatlands, Plean Street, Dalmarnock, and Sighthill. The photographic project is framed by two key events at the Red Road : the first the 2007 attempt by Didier Pasquette to walk a tightrope suspended thirty stories above the ground between two tower blocks; the second the aborted attempt to launch the Commonwealth Games by blowing the same towers up before the assembled leaders of the former British Empire in 2014. Its something of which Leslie was aware as he embarked on his photographic journey: ‘I was all set for a return trip to one of my existing haunts, somewhere really edgy and photojournalist friendly – maybe Rwanda or Bosnia?’ but he soon decided that ‘perhaps Glasgow could be the edgy photojournalistic city I was looking for.’ Particularly as the Glasgow he wanted to photograph was just about disappear, in the ‘urban renaissance’ leading up to the Commonwealth Games. It’s a point of view that suffuses the lush and beautiful photographs he produced on his journey, in which his camera renders the suburbs of Glasgow as exotic, as othered, as distant, as those war zones far away. Sometimes the view is beautiful. Tower blocks catch the weakling west of Scotland sun, like the spires of churches in Caspar David Friedrich paintings. Seen from from miles away, they glitter against snowy hills, or glow, shrouded in scarlet scrim, in a grey fog. Sometimes the camera excavates forgotten subterranean worlds. The abandoned Mecca Bingo of the Red Road underground feels like the like the broken vaults of a Piranesian prison, The Brig the pub next door, has all the eerie stillness of a pharaonic tomb. These are images designed to inspire awe, to alienate, to render a city strange, There’s a romanticism about them, a trangressive pleasure in the realisation that a city once happy, once optimistic, once ordinary, could have come to this extraordinary apocalypse. It’s a lost optimism that some of Leslie’s photographs try to recover. His images of the Gallowgate towers, stripped back for demolition, are overlaid with faded, yellowing transparencies of photographs of the same balconies fifty years before, when they functioned as streets in the sky, filled with playing children. It was heaven; and then what happened at Plean Street, was the same as what happened everywhere else: ‘we had all sorts of vulnerable people moving in, undesirables you might call them…’ the heroin trade took hold, and that, as it was everywhere else, was that. It’s the buildings that get the blame; and in this book, their punishment is lovingly, almost gleefully, documented. Sometimes the camera inhabits an interior that has ceased to be one; the windows blasted out, the wallpaper peeling, the marks of absent pictures and shelves hanging on the wall. What was once a cosy sitting room is exposed, like an empty eye socket, to the elements. Buildings in the process of demolition turn from being constructions into geologies: crags, bluffs and, eventually, just humiliating piles of rubble and dust. And when the buildings get the blame, it’s the people who live in them that suffer. When people appear in Leslie’s photographs, they are, largely, framed by the ruins of their former homes. Sometimes Leslie has taken them there himself, to confront them with what’s happened. That may to overegg just how blissful welfare state Glasgow might have been; but this book certainly purveys a strong sense of a city whose citizens are resigned to having their city done to them, rather than participating in its creation and maintenance. The skyline of Glasgow is set to be radically transformed, as swathes of tower blocks make way of thousands of new homes across the city. Glasgow is enjoying a real renaissance. We are delivering on better housing and we have regained our sense of ambition. This is an announcement that looks to the future and we will not repeat the mistakes of the past. And perhaps that’s where the value of a book like this lies. I confess I felt uneasy, sitting in my Edinburgh café with a latte, leafing through the glossy pages, thinking of Friedrich and Piranesi, and peering into a world that, while it is forty miles away, felt as distant and strange as the war zones of Rwanda or Bosnia. Jonny Rodger characterizes these images as ‘archaeological’ and in once sense they are: an uncovering of something buried beneath the visible conscious realm of Glasgow. But its not places that are uncovered in these photographs, or not only places; it is times, too: the moment between abandonment and destruction, of a Glasgow not disappeared, but still disappearing, still waiting – in the words of the artist Emma Cocker (written about that other Scottish Concrete, Cardross Seminary) no longer and not yet. Building development –and our experience of it – aren’t just, or really, about befores and afters. Rather, they are about in betweens, in which people clear their living rooms, and pack their bags, or hang on in streets that empty, house by house, or watch as towers teeter rather than fall on demolition day, and no-one really knows, or trusts, what will happen next. It’s a time that a city like Glasgow, if it every chooses to have another renaissance, would to well to remember. Disappearing Glasgow is published by Freight Books. For another interesting historical document of Glasgow, see French photographer Raymond Depardon’s 1980 photos of Glasgow. The shots were commission by the Sunday Times but never used. All the Depardon photos can be viewed here. OMG. I was 18 in 1980. Glasgow looks grim and so do the people. What an indictment upon those who were running that city. It’s heartbreaking to view and be reminded of the neglect that was and still is accepted by too many folk. + I grew up in Priesthill another place that is mostly erased and barely recognisable yet not that different for the feelings it evokes each time I visit from Australia. The article should be called Disappearing Glasgow Schemes. These photos are not of a complete Glasgow and therefore are somewhat false. It’s akin to taking photos of the down side of Harlem or the South Bronx and calling it New York. Let’s remember, and I do as a senior Glaswegian, that Labour held political power during all those years, and before. The road to hell paved with incompetent good intentions and criminal corruption. It’s been done many times before. e.g. Photos of the old Gorbals as Glasgow.